Hertford Union Top Lock Winding Hole is a minor waterways place minor waterways place place on the waterways major waterways place village town city on the Grand Union Canal (Hertford Union Canal) between Hertford Union Junction (Junction of Regent&apos;s and Hertford Union Canals) (5¼ furlongs to the southwest) and Hertford Union Canal Junction (Junction of Hertford Union Canal and River Lee) (3½ furlongs and 3 locks to the northeast). The nearest place in the direction of Hertford Union Junction is Armagh Wharf; ½ furlongs away. 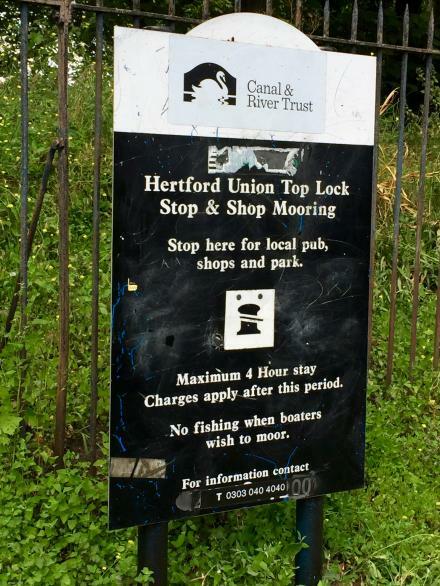 The nearest place in the direction of Hertford Union Canal Junction is Hertford Union Top Lock No 1; ¼ furlongs away. Mooring here is ok (a perfectly adequate mooring) , no information available. Mooring is limited to 4 hours. Just above the winding hole is a 4 hour stop&apos;n&apos;shop mooring. Just above the winding hole is a 4 hour stop'n'shop mooring. Information last edited Friday the 19th of January, 2018 at 10:42 PM by Shultzy. Queen Elizabeth Olympic Park, London, E20 2ZQ — 1504 yards to the east. Olympic Park, Stratford, London, E20 2ZQ — 1483 yards to the east. London — 1306 yards to the southwest. Swan Wharf, 60 Dace Road, London, E3 2NN — 644 yards to the east. London, E20 1 — 1342 yards to the northeast. London — 1002 yards to the southwest. Queen Elizabeth Olympic Park, Stratford Waterfront, London, E20 2ZP — 1359 yards to the east. Victoria Park, London — 1200 yards to the west. Queen Elizabeth Olympic Park, London — 1339 yards to the east. Unit GF1, Bow Wharf, Grove Road, London, E3 5SN — 1117 yards to the southwest. Olympic Park , Stratford, London, E20 2ST — 1028 yards to the east. Queen Elizabeth Olympic Park, London, E20 2ST — 1052 yards to the east. London, E13 9AZ — 1076 yards to the east. London Stadium, Queen Elizabeth Olympic Park, London, E20 2ST — 1051 yards to the east. 360 Victoria Park Rd, London, E9 7BT — 709 yards to the northwest. Bow — 589 yards to the south. London — 1426 yards to the northwest. 3 Prince Edward Road, Hackney Wick, London, E9 5LX — 899 yards to the northeast. London, E3 5 — 732 yards to the south. London, E3 3 — 1499 yards to the southeast. London, E9 5 — 733 yards to the northeast. Queen Elizabeth Olympic Park, London, E20 2ST — 1188 yards to the east. London, E20 3HB — 1100 yards to the northeast. London, E9 7DE — 603 yards to the west. 92-94 Wallis Road, London, E9 5LN — 954 yards to the northeast. Unit 6, Hamlet Industrial Estate, 96 White Post Lane,, London, E9 5EN — 799 yards to the northeast. Queen Elisabeth Olympic Park, Stratford, London, E15 2DU — 1379 yards to the east. 7 Roach Road, London, E3 2PA — 729 yards to the east. London, E3 2 — 990 yards to the south. London — 1596 yards to the south. London, E3 2 — 564 yards to the east. 90 Main yard, Wallis Road, hackney Wick, London, E9 5LN — 968 yards to the northeast. Unit 3 Canalside, London, E20 3 — 1214 yards to the north. Queen Elizabeth Olympic Park, London, E20 3HB — 1086 yards to the northeast. Autumn Yard, Autumn Street Unit 3, London, E3 2TT — 833 yards to the southeast. 1453 yards to the northwest. Unit 2 68 - 82 Digby Road, Homerton, London, E9 6HX — 1610 yards to the northwest. Queen Elizabeth Olympic Park, London, E20 2AD — 1315 yards to the east.